"Doubt is our product," a cigarette executive once observed, "since it is the best means of competing with the 'body of fact' that exists in the minds of the general public. It is also the means of establishing a controversy. "In this eye-opening expose, David Michaels reveals how the tobacco industry's duplicitous tactics spawned a multimillion dollar industry that is dismantling public health safeguards. 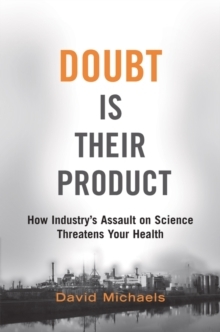 Product defense consultants, he argues, have increasingly skewed the scientific literature, manufactured and magnified scientific uncertainty, and influenced policy decisions to the advantage of polluters and the manufacturers of dangerous products. To keep the public confused about the hazards posed by globalwarming, second-hand smoke, asbestos, lead, plastics, and many other toxic materials, industry executives have hired unscrupulous scientists and lobbyists to dispute scientific evidence about health risks. In doing so, they have not only delayed action on specific hazards, but they have constructedbarriers to make it harder for lawmakers, government agencies, and courts to respond to future threats. The Orwellian strategy of dismissing research conducted by the scientific community as "junk science" and elevating science conducted by product defense specialists to "sound science" status also creates confusion about the very nature of scientific inquiry and undermines the public's confidence in science's ability to address public health and environmental concerns. Such reckless practiceshave long existed, but Michaels argues that the Bush administration deepened the dysfunction by virtually handing over regulatory agencies to the very corporate powers whose products and behaviour they are charged with overseeing. In Doubt Is Their Product Michaels proves, beyond a doubt, that our regulatory system has been broken. He offers concrete, workable suggestions for how it can be restored by taking the politics out of science and ensuring that concern for public safety, rather than private profits, guides our regulatory policy.